Dr. Sinan Ogan was born in Igdir, 1967 and is the Founder and president of the Center for International Relations and Strategic Analysis. He was graduated from Marmara University, Faculty of Business in 1989. At the same university in 1992, he studied master degree with emphasis on the Financial Law / Banking in Azerbaijan in the field of Economic and Structural Analysis of the Financial Sector. Then in 2009, he recieved his PhD from Moscow University on International Relations and Political Science. Between 1992-1998 worked as a research assistant at Marmara University Institute of Turkish Studies. 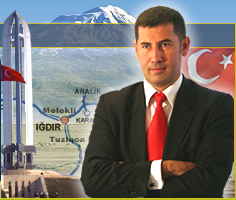 Since 1993, Dr. Ogan worked in Azerbaijan State Economic University. In 2004 he establihed and Chaired TURKSAM, Center for International Relations and Strategic Analysis. TURKSAM, since 2007 has become one of Turkey’s most important institutions of thought.